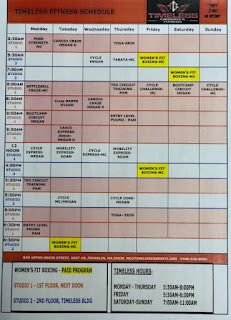 Franklin Matters: Timeless NEW FITNESS STUDIO! Our NEW Timeless FITNESS STUDIO is now OPEN! Come JOIN Timeless Fitness and experience our NEW FITNESS STUDIO packed with classes that speak to every body and every level of Fitness! 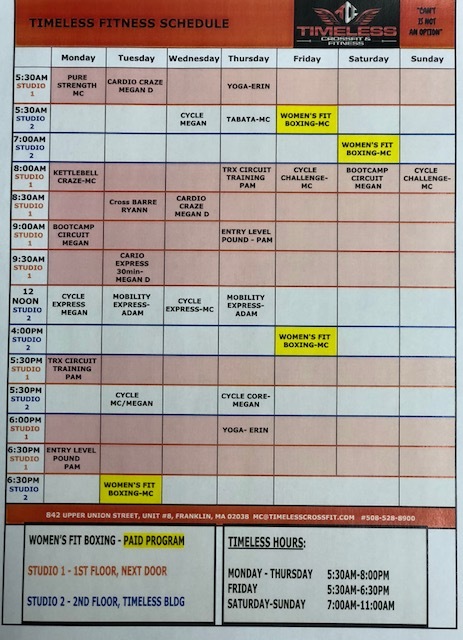 You can choose from BARRE, Cardio Craze, Cycle/Core, Yoga, Tabata/HIIT, Cycle, TRX, Bootcamp, Noon Time Express Classes, Kettlebell Craze, Entry Level Pound, Mobility Express, Women's FIT Boxing, and so much more! We want the best for our members offering services from health and wellness, Physical Therapy, Massage, Nutrition-Licensed, Registered Dietitian, and top notch qualified instructors/coaches who will help you be fitter for life and be your best self. Come give a class a try FREE! Our NEW FITNESS SCHEDULE Begins this MONDAY, 3/19/18.